10 strange and striking hi-fi adverts from the 1980s | What Hi-Fi? 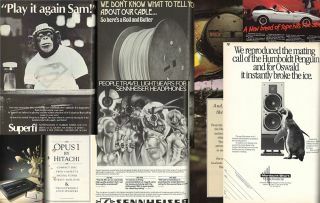 It's been around 30 years since these adverts from Technics, Superfi, Sennheiser and Naim have seen the light of day. Featuring headphones, amps, loudspeakers and CD cleaners, take a look at some of the oddest marketing messages that hit What Hi-Fi? 's pages in the 1980s. Here’s the 411: by the time the 80s came around the 70s were bunk; 1980 was banging, boss, and the bomb - especially in the world of hi-fi technology. Philips and Sony came together to develop the Compact Disc Digital Audio (CD-DA) standard in 1979 and by the next year the CD was cutting-edge tech. Sony’s first Walkman gained popularity in the West with more than 50 million manufactured by the end of the decade. And VCRs became affordable for the first time, letting viewers record and fast-forward through television programmes. Magic. Superfi's, er, super-chimp advert is a stand-out because of all the questions it raises. Why is the advert referencing the common misquote in Casablanca (or, possibly, the Woody Allen film of the same name?). Why, in a magazine primarily about hi-fi reviews, would you want to dismiss them as 'just an opinion'? What relationship does that have to an ape? We're thoroughly confused. If aliens came to Earth, what sort of music would they listen to? Would it be something from the Voyager golden record? Do they, in fact, hate the blues? Or maybe they would prefer the music of the spheres? Whatever the answer, Sennheiser thinks our extraterrestrial guests would be using the HD 40, 410 and 420 on-ear headphones - although we can only hope our new alien overlords, having mastered space travel, would come with some more advanced hi-fi kit. In some magazines, a three-page foldout would usually contain lewd or raunchy photos. In What Hi-Fi?, readers are treated to Pioneer's witty marketing department. Presumably Pioneer thinks that, although a member of the church might be bound by celibacy, there's no substitute for the relationship between a man and his receiver, specifically the SX-700L. And while finding a needle in a haystack might be challenging, the CT-520 cassette player could apparently search though the tape for blank spaces that denote a change in song. Do you know what Naim Audio is saying in this advert? Because we don't. Maybe the expression 'a roll and butter' had a double meaning 30 years ago, one that has passed our team by, but we can't work it out. If you can, leave us a note in the comments, tweet it to us, or send us a Facebook message - frankly, we're baffled. We're happy to see that Maxell has moved on from its grotesque tape-human hybrid into more conventional adverts; its UDI tapes are apparently so impressive that even those on the bus next to you will have to listen. However, this also seems to include the bus driver, so perhaps it's better that technology has moved on - lest the quality of Maxell tapes cause havoc on our streets. We've all heard the myth that an opera singer can shatter glass (which turns out to be true, in fact), and that's pretty impressive; but the power necessary to shatter a marble bust would be phenomenal. Nevertheless the Opus 1, Hitachi's hi-fi system and tape and CD player, is billed as the piece of kit to do it. It's a shame that modern health and safety rules probably forbid making hi-fi kit that could destroy family heirlooms. What's the world coming to, eh? What could be a better advertisement for hi-fi than the prospect of some hot and heavy penguin love? For Mordaunt-Short, there's clearly nothing better. We've reviewed a number of the company's loudspeakers in the past, priced from a couple of hundered pounds to a couple of thousand. However, no penguins have ever written in to confirm Mordaunt-Short's claims. What particularly sets Technics' 1980s adverts apart, for the company's X990D integrated amplifier and SLP-990 CD player with power amp respectively, is just how lonely and sullen its made the men look in comparison to today's adverts. Before the days of silhouettes dancing to iPods on multicoloured backgrounds, or sleek speakers forged of aluminium and mythril, men would sit in the darkness; either looking forelorn at their amplifiers as you would a lover that jilted you, or among their own kind in an apartment building being "boogaloo dudes carry[ing] the news". "From the nation that brought us the moon", a statement that could either refer to the company's origins in America or that it knew something about a civilisation living under the watery depths that we didn't, this advert looks like a very underwhelming adaption of the Excaliber story. In 1991, Recoton purchased the financially troubled Discwasher company, but had gone bankrupt in 2003. Alas, times change, and technology progresses; from vinyl to CD to streaming onwards. MORE: That Was Then: The first issue of What Hi-Fi?